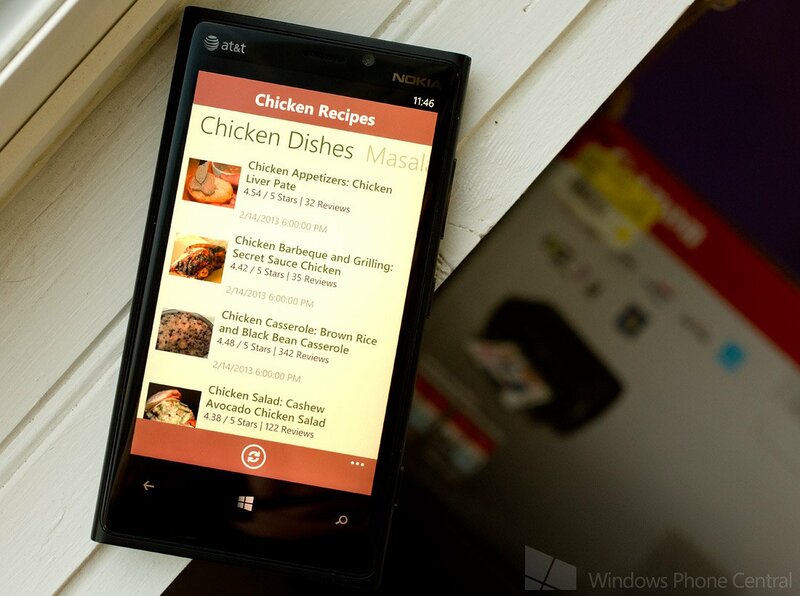 Chicken Recipes is a Windows Phone app that delivers a collection of meals featuring chicken as the key ingredient. I can remember my doctor advising me to eat more two legged animals than four legged every time he reviews my cholesterol levels. It's no secret that part of being fit is having a healthy diet and chicken can be a key ingredient to a nutritional meal. Plus it makes those Chick-fil-a cows happy. While this Windows Phone app has potential but left us a little on the hungry side and may have some asking "where's the beef?" Chicken Recipes starts out nice with two pages full of chicken recipes. Chicken Dishes contains everything from barbeque recipes to pasta dishes. Masala Chicken should offer recipes with more of an South Asian cuisine but seems to be a hodge podge collection of recipes. Some using chicken and others that have no relation to chicken (doughnuts, pumpkin cheesecake, etc.). And it is here we see the potential for this app begin to unravel. In tapping on an individual recipe, you are taken to a screen that displays the recipe's ratings and a small description or quote for the dish. To view the full recipe you have to tap a link that will send you to the AllRecipes.com website that lists the ingredients and steps to prepare the dish. While there isn't much meat on this app's bones, you also have to question the recipe selection. Chicken Recipes is listed in the Diet+Nutrition section of the Windows Phone Store and you would think it focuses on healthy menu items featuring chicken. Right? But you have listings for Bacon Chicken and Dumplings and Fried Chicken. While I'm sure these dishes are tasty, they don't sound very diet and nutritious. 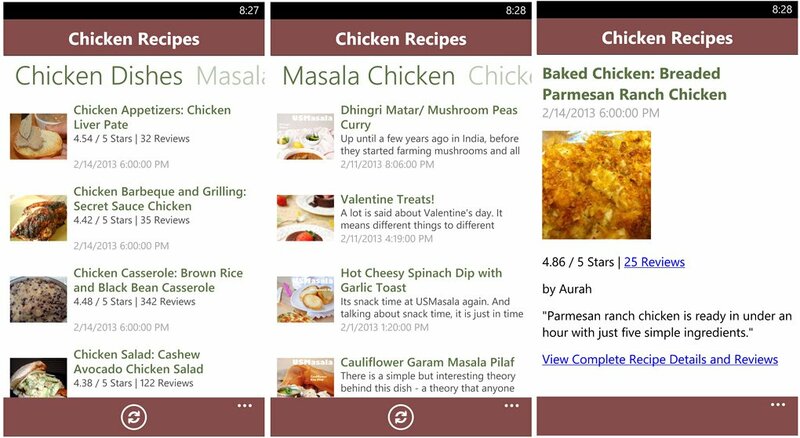 All in all, we are glad Chicken Recipes is a free app for our Windows Phone. I think the app has potential if it would pull the recipes directly into the app instead of being a middle man for AllRecipes.com. For that, you're probably better off just downloading the AllRecipes.com app instead to help you along with Fitness Month. For those curious, you can find Chicken Recipes here in the Windows Phone Store.